With over 3 decades of experience in supplying equipment and expertise to the water bottling industry, Enterprise Tondelli has a great deal to offer. 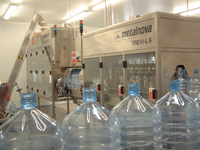 Our experience has ranged from supplying turn key water bottling plants to specialist ozoniser or water processing units for removing iron and manganese without the use of chemicals. 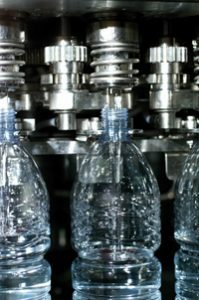 At the heart of the water bottling plant is the filling machine and we have solutions to achieve the best hygiene possible. These are such items as the patented baseless filler, cap sterilisation, filtered air filler housings coupled with various type of non contact filling valves all of which ensures product integrity. For polycarbonate lines the use of a double ended washer with two completely independent sections between the two hygiene areas to prevent potential carry over of dirt on the carrier chains or holding heads shows the lengths we are prepared to go to ensure your product is not contaminated. Still and carbonated water bottling lines can be from 500 bottles per hour to 60,000 bottles per hour in glass or PET bottles. For 19 litre or 5 gallon polycarbonate returnable lines we can supply from 300 bottles per hour up to 4,500 bottles per hour as standard. There is also a tendency in water bottling to have square bottles and we have handled these with success. Whether that is through the use of a continuous type laner or the supply of a shrinkwrapper with a special 90 degree turning infeed, Enterprise Tondelli has the solutions. 22,000 bottles per hour still water bottling line with a non contact type filling valve to prevent contamination. 900 bottles per hour non returnable 15 litre PET bottling line with on-line blow moulding. 4,000 bph x 19 litre returnable water coolers complete with automatic rack loading. 48,000 bottles per hour 500 ml PET water bottling line. 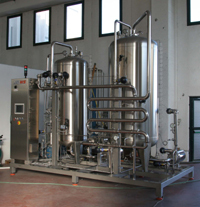 So whether you require a complete turn key water bottling plant or a single piece of plant for your water bottling plant Enterprise Tondelli can fulfil your requirements with the benefit of over 30 years experience.